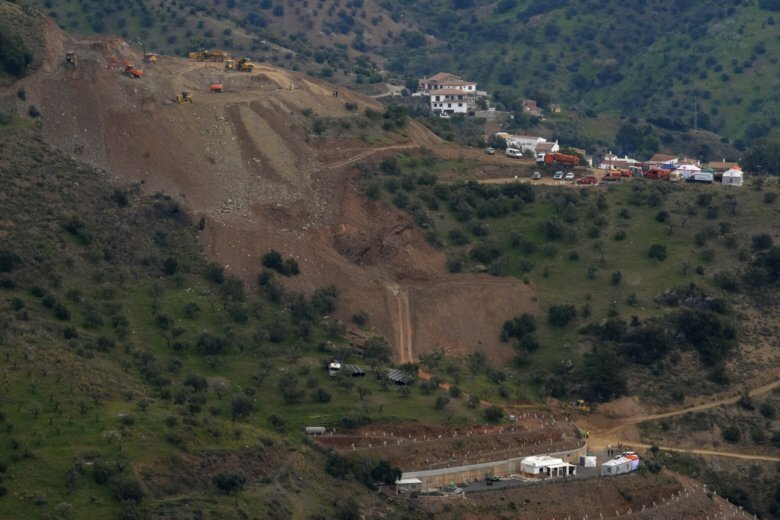 MADRID (AP) — Rescuers in southern Spain said Sunday that the frantic effort to reach a 2-year-old boy who fell into a narrow, deep borehole seven days ago has again been slowed by difficult terrain. “We are working through material that is becoming harder and harder, and that is why the drilling operation to make the shaft is being held up,” said Angel Garcia, the leading engineer coordinating the search-and-rescue operation. There has been no contact made with Julen Rosello, who fell into the 110-meter (360-foot) deep shaft a week ago during a family meal in the countryside northeast of Malaga. At just 25 centimeters wide (10 inches), the borehole is too narrow for adults to enter. Rescuers hope to find him at a depth of 72 meters (236 feet), where soil has blocked the borehole. A specially-made cage has arrived at the site, ready to lower mining rescue experts down the shaft once drilling is complete. The experts will then start digging a horizontal tunnel to the spot where they believe the boy is trapped in the borehole. People across Spain have been gripped by the plight of the boy and his family, as the rescue attempt has suffered agonizing delays because of the rocky terrain.